The Atlantic waters are the hottest on record and it hit 95 on my car outside temp gauge today. 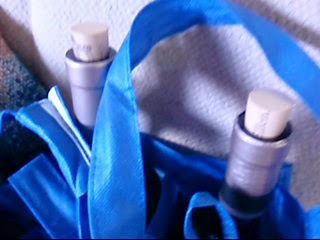 The heat was enough to pop the wine corks sitting in the trunk of my friend's car - as you can see in this photo and video. Apparently that is not all that's popping off - Mr. Michael Berry apparently got mad about a Mosque being built near the World Trade Center in NY and called for it to "be bombed." That puts him in the same league with people who bomb buildings to make their point; people like Al Qaida. Since when is promoting violence an adult, acceptable thing for a talk show host? What's next. Promoting Murder? Jerusalem hosts the Christian church, the Grand Mosque and Jewish Synagogue in the same place - and it hasn't caused the world to end. Muslims revere Jesus and Mary both (its in the Koran if you look it up). America was founded on the principle that one religion would not rule all the others -- as it was like in the England when our founding fathers fled. Mr. Berry needs to do some traveling and get a grip on his brain. Just like most Catholics are not IRA bombers (remembers the 70's?) and most white guys are not extremists like Tim McVeigh, the Oklahoma City bomber, most Muslims are NOT terrorists, only the fringe like Al Qaida, the former IRA, or the Taliban make up that fringe. We live side by side with them every day in Houston. You are probably buying gas, cigarettes and beer from them. Did they shoot you walking in or out of the store? No. Get a grip folks. Americans need to travel and get some reality. Mr. Berry should have known better, having an Indian wife. He needs to go spend time in places like Pakistan (right next to India), Indonesia and talk to ordinary people -- instead of sounding like an extremist himself. Actually, he should go to some of the Houston mosques and talk to the ordinary people there. I have. Even our Congressman have been in them. Mr. Berry will find that they are like any American - wanting respect, a chance to do their job and be left alone, and education for their kids. They want peace, not war. Get a grip folks! We have enough nuts in the world without encouraging our own nut cases to go bomb a building. How does our violence make us better than 'them'? When Mexico President Calderon addressed a joint session of Congress yesterday, most GOP representatives blew him off -- and failed to attend the session to hear his words. Then, when Calderson said that the drug lords were getting assault weapons from American gun dealers that had led to thousands of people killed, the GOP reps criticized him! The message from the GOP is, apparently, that it is OK for American gun dealers to sell deadly assault weapons to drug lords - who have killed over 20,000 people in the last 3 years. 80% of the 75,000 weapons seized from gangs in the last 3 years have come from American gun dealers. Over 7,000 of them line the border from Texas to California. Where is the Congressional outrage? 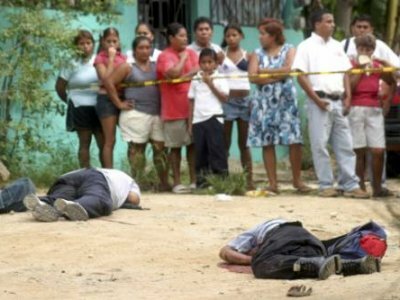 It's illegal for Mexican citizens to own guns so our failure to control gun sales to drug gangs gives them even more power over innocents as well as the Mexican police. This lack of respect by our Congress reps of our neighbor's President was uncalled for. Third graders act better than that. Siding with drug gangs on guns is even worse. To put it from a different perspective, how would Israel feel if our gun dealers were selling these weapons to the Palestinians? And where is the NRA on this? Do they support selling assault weapons to drug gangs? The ban on these weapons was lifted in 2004. This is the result. What kind of 'War on Drugs' is it if it is OK for dealers to sell no less than 75,000 weapons to criminals in a country where drug gang violence is out of control? Yes, we need a change in Washington alright. We need less of people like TX Sen. John Cornyn and a party that thinks giving the finger to our neighbors is a solution. The fight against drug gangs will require joint cooperation - a raised middle finger and failure to keep our people from dealing in illegal weapons won't cut it. Perhaps the GOP will wake up when these Mexican drug gangs use American-bought assault weapons on our border agents and citizens --which they already have! Armoring My Van In McAllen - With Blast rated Film! An Oil Spill + Hurricane season starts in 2 weeks! I had an unpleasant thought this morning while shaving - Millions of barrels of oil in the Gulf and HURRICANE season starts in 2 weeks! What happens if all that crude gets churned up and cast ashore in a storm? Until now, the oil has not hit the beaches in a major way. But if a storm blows in, the booms will blow away. I attended a Seabrook hurricane preparedness program last night. The NOAA speaker said we are looking at an "above average" season. One bad sign: The Atlantic ocean temperature is already at a record high. He said that the Gulf of Mexico is cooler, but will heat up fast. This means that an early hurricane combined with the millions of spilled crude in the Gulf could end up being flung on large sections of the Gulf Coast - from the U.S. to Mexico. If the Gulf stream is carrying it to the East Coast, they could also be affected by the Deepwater blow out. Bottom line: We have the makings of an even greater environmental disaster. And there's not a lot that can be done about it until the well is capped. And even that the volume of the spill is so large that a hurricane could reek hell on our coast in more ways than one. 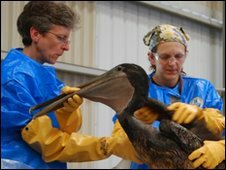 From "Drill Baby, Drill" to "Spill, Baby, Spill"
Where is America when it comes to solar and wind energy we can get for free and doesn't spoil our seafood? We need to pass a Renewable Energy bill NOW!